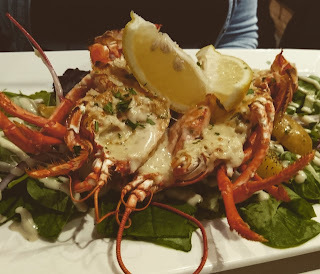 Ah, seafood – Scotland’s secret shame. Our waters are home to such wonderful produce. Why don’t we eat it? Exporting it just seems like such a waste. Rose Street may be famed for pub crawls, but it also acts as a convenient hotspot to showcase our natural larder to our many foreign visitors, especially during Festival time, so I dearly hoped The Mussel Inn would provide suitable evidence to suggest visitors would leave with a positive impression of our fishy treats. The al fresco area was packed as I clocked a line of 15-20 tourists trying to obtain a table on this bright Thursday evening. Thankfully, I had reservations. When you see a restaurant this busy, it really adds to the pressure: will I be waiting long between courses? Will the order be accurate? Will there be staff frantically banging into each other, struggling to cope with the volume? 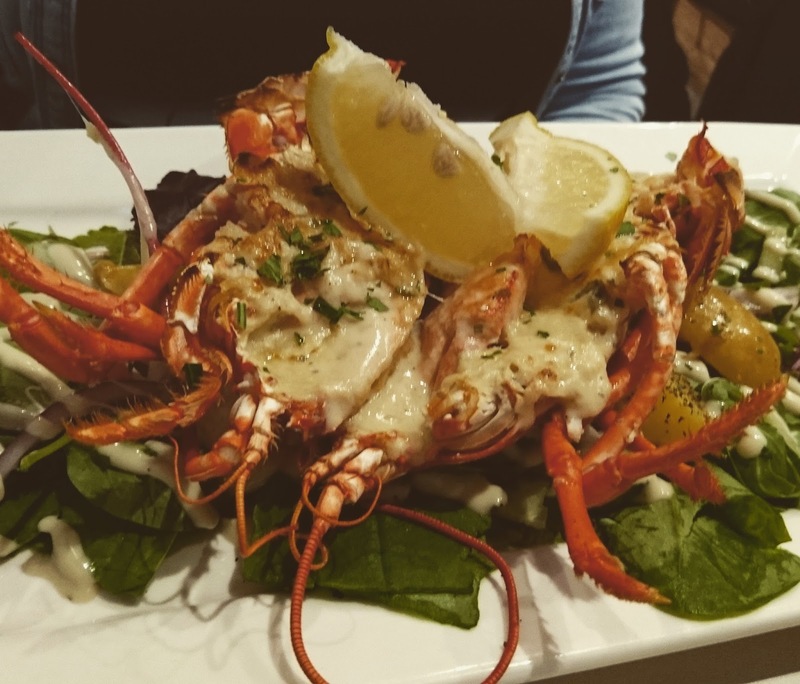 The menu is an extensive one and focusses heavily on shellfish. There’s an appetising array of scallop, oyster and mussel dishes that suggest the seafood is cooked simply – as fish should be – and that’s refreshing, although fish ‘n’ chips is a notable omission. Despite the crowded interior, my starter of marinated tiger prawns, grilled with red onion, chillies with parsley and garlic butter (£7.40) arrived swiftly with the punch of garlic arousing the palette. Five plump prawns were just about cooked properly with the fresh flavours from the marinade all identifiable with each mouthful. I liked the addition of the grilled baguette that soaked up the sauce which became even more delicious with a squeeze of lemon. Sarah opened with grilled queenie scallops with pea puree, crispy pancetta and pea shoots (£6.50). This is a combination of flavours that we know works, but the balsamic vinegar overpowered the scallop and didn’t need to be there in such an abundance, if at all. The scallops were sweet and tender and I liked seeing the roe still attached, but the puree was wishy-washy, although it tasted fine. The pancetta crumb added texture and smokiness, just a pity about the balsamic. I have to pay tribute to our delicious wine selection. Castillo de Monjardin “El Cerezo”, this unoaked chardonnay from Spain sparked a debate about whether we had ever tasted a bad Spanish wine. The answer was a resounding ‘no’. As the plates were cleared, I began to take in the surroundings. It was packed with people, yet still spacious and unobtrusive. The interior is largely no frills, and I can imagine this restaurant in Spain in the vanguard of the busy café scene, churning out seafood with a good wine accompanying the jolly, sun-kissed banter. That’s the dream life. Scallops are my favourite, so I went for the pan-fried option with smoked haddock, mascarpone and pea risotto with Parmesan flake which came in just south of twenty quid. The scallops were cooked bang on the money, and the risotto was rich and creamy with the tender flakes of smoked fish giving real depth of flavour along with the burst of fresh, sweet peas. The rice itself was soft and competently cooked with the cheesy crisp bringing in some seasoning, although it was a little on the soggy side. An enjoyable eat, nonetheless. Over the table, Sarah went for the lobster thermidor special (£32 for the whole one, available until the end of August). The meat was bountiful and sweet with the light and tangy sauce a real star. The little potatoes alongside were creamy and thoroughly enjoyable. We indulged in a side of chips (£3.80), which came in handy for scooping up the risotto and cheesy lobster dressing. For pudding I was impressed by the light mousiness of the strawberry cheesecake (£5.50) with fruits of the forest which provided the palette cleanse after a big dinner. Sarah had the chocolate torte (also £5.50) which had a pleasant orange flavour, heightened by the addition of the orange-flavoured cream. Almonds provided texture to this airy cake, although it was a little dry in parts due to being reheated. Service was very efficient despite the volume ad I was pleased this was the case having read so in other reviews whilst researching this eatery. Our server was very confident and knowledgeable about the menu and looked like she enjoyed chatting with customers. In culinary terms, there are few things worse than overcooked seafood, but on the flip side, fewer things more enjoyable. Our larder gives us a gift that we don’t appreciate enough, but thankfully The Mussel Inn exemplifies genuine artistry when it comes to handling seafood, and will leave diners with an overwhelmingly positive impression. MaxMunus Offer World Class Virtual Instructor led training on ALFRESCO. We have industry expert trainer. We provide Training Material and Software Support. MaxMunus has successfully conducted 1,00,000 + trainings in India, USA, UK, Australlia, Switzerland, Qatar, Saudi Arabia, Bangladesh, Bahrain and UAE etc. RECENTLY SARAH AND I attended the wedding of her father to Anne-Marie Murphy, who happens to come from over the pond in Canada. To help celebrate the occasion, I was charged with producing tablet for the wedding favours. Naturally, whisky and maple syrup would be the flavours of the day on this momentous occasion. Maple syrup really takes me back to my childhood. When my brothers and I stayed at my nan and grandad's at Southerton Crescent in Kirkcaldy, nan would make us waffles with bacon and maple syrup for breakfast whilst our pack of Yorkies mooched under the table for bacon. This was back in the early 90s when maple syrup was difficult to get in the UK, but grandad worked in the States and would bring back bottles of it from over the border. It's funny, my nan's recipe was passed down through the generations, but they never quite taste the same as the waffles nan made for us. This is a great dish to showcase Scottish produce. it requires little prep work and really brings fine dining into the home! It's a great dish to persuade non-seafood lovers to like fish, as scallops are quite meaty and sweet. 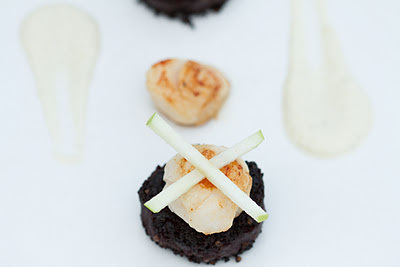 Stornoway black pudding (I use Charles MacLeod) is another of my other favourite Scottish foods and just works so harmoniously with the other flavours in this recipe.